The Mumbai-based company has taken a decision to halt flights on a temporary basis. 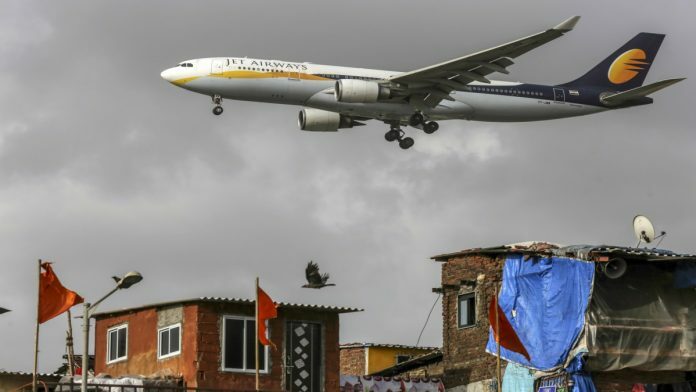 Mumbai: Jet Airways India Ltd. suspended operations after the cash-strapped carrier that once ranked as the nation’s biggest by market value failed to secure a bailout. The Mumbai-based company has taken a decision to halt flights on a “temporary” basis from Thursday, it said in a statement late Wednesday, when the last service was scheduled to take place. Jet, which broke the monopoly of state-run Air India Ltd. in the early 1990s, has been in decline since a slew of budget airlines started offering ultra-low fares that hurt profits and led it to pile up more than $1 billion in debt and dues owed to employees and aircraft-leasing firms. A collapse of Jet Air would threaten about 23,000 jobs and is reminiscent of the fate suffered by Vijay Mallya’s Kingfisher Airlines Ltd., another indebted airline that had to be grounded. The crisis comes at an awkward time for Prime Minister Narendra Modi, who is battling concerns about unemployment as he seeks re-election in national elections that started April 11. Brings to mind a scene from Titanic. Late evening, the sun is setting, there is a voiceover which says, That was the last time the ship saw daylight.